Home Pokémon Pokemon Card of the Day Lysandre’s Trump Card – Joins the Pokemon Ban List! Lysandre’s Trump Card – Joins the Pokemon Ban List! Ohhhhh the days when this card was legal. Probably the most infamous card on the list, Lysandre’s Trump Card was one of the biggest game-defining cards when it came out – so much so that not only was it banned in Expanded, but it was banned in Standard only a few months after its release in Phantom Forces. 1) it eliminated the deck-out win condition for your opponent – sure, you couldn’t win by deck-out if you played Lysandre’s Trump Card, but having a card that denies your opponent the ability to win the game is pretty powerful. Imagine if there was card that only had to get placed on the table in order to say, “Your opponent can’t take their last Prize card for the rest of the game”. That’s the level of power we’re looking at with Lysandre’s Trump Card. Now theoretically, even after a Trump Card gets played, you could still win by deck-out, but the chances of that happening drop drastically after a Trump Card is played than before. I mean, have you tried decking out 80+ cards? It’s hard enough to deck-out 60 cards, and if your opponent used a Trump Card, they just reverted all the work you put into it. 2) it allowed for the repeated use of Trainer cards – at the time, there were a lot of powerful Trainer cards that were in the game. Sycamore, Enhanced Hammer, Battle Compressor, Muscle Band, Lysandre himself – and that’s just a few of the cards that could get reused by this effect. One of the most notable strategies centered around Seismitoad-EX, a Pokemon that could, for only a DCE, deal 30 damage and stop your opponent from playing Items during their next turn. Combined with Enhanced Hammers and Crushing Hammers, the deck aimed to keep your opponent from powering up their Pokemon and speeding through their deck until you eventually won outright through a war of attrition. Lysandre’s Trump Card just let you have 8 copies of each Hammer all at once. 4) it kept the game going on forever and ever and ever – one of the biggest problems that the Trump Card provided was extending gameplay time by a huge margin. Again, it’s the idea that you’re drawing from your deck twice, getting the same cards and enacting the same plays, but the more cards you put back, the longer the game would go on for. With no threat of decking out, the only thing that could happen was that time would run out on you, and anyone who’s been playing the game competitively would likely tell you that it’s no good to run into a tie game simply because your opponent played a Trump Card. Lysandre’s Trump Card had a simple effect that completely redefined how decks would play at the time, overcentralizing the game around itself, and eventually finding itself banned for all its efforts. Turns out that maybe it’s not so great an idea to give everyone a Trump Card. …I’m not sorry for that. Arora Notealus: The Trump Card has been reviewed only once before, where it landed at #1 on our Top 10 List for Phantom Forces. Even then, it seems like we had underrated the card on first inspection, seeing as it had such an unusual effect, but given the time it was out, it became far too powerful. On another note, another card that recently hit the ban list was Puzzle of Time, which we’ve reviewed a few times before – you can see our latest review of it in the Top Cards Lost to Rotation! Side Review: Dialga-GX – Type changes do give Dialga-GX a better chance against some decks, but the deck itself isn’t really around. Perhaps people think the card’s GX Attack isn’t worth the cost? That Shred is an underwhelming attack? That Overclock isn’t good enough even as a set-up move? Who can say? Next Time: Well if you can’t guess what’s coming up on Wednesday, you haven’t been paying attention to the Ban List. 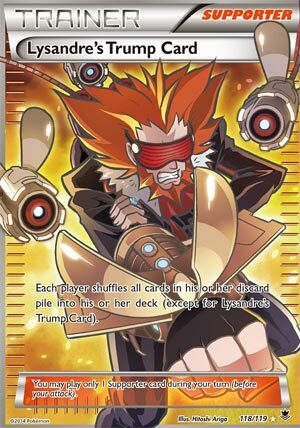 Lysandre’s Trump Card seems fitting for what he actually does in the TCG and what he almost tried to do in the games and in the anime. Apparently, launching the ultimate weapon was a way to destroy the Kalos region and to recreate the world. And somehow that notion got translated to the TCG in a way that both players get all of their cards back from the discard pile onto their decks except for Lysandre’s Trump Card because, apparently, he remained underneath the rubble of Geoscene Town, never to be seen again, or in the anime’s case, gets sucked in the void from Zygarde 100%’s Core Enforcer Attack. That’s why Lysandre’s Trump Card was the best card of the XY Phantom Forces Set. Looks like his ideal thinking of what a “reset” is isn’t agreed by a majority of people (and when I mean majority, I mean 99.9% of people doesn’t like his ideology). So he was legal between the set’s release and its eventful ban, which was in June 15, 2015 internationally and June 20 on Japan. The reason boils down to eliminating one of the victory conditions (which is decking out), which leads to extended time spent on just a single game. Indirectly, having Lysandre’s Trump Card would mean that you can be extremely mindless about your resources and still get each and every single card back in your deck, creating a full recovery. And you can repeated use your powerful cards. Even though this uses up your Supporter for your turn, that sheer power that he exhibits is very well worth your usage for your turn. Outside of reasons why he got banned, he would’ve been a good counter on decks that relied on the discard pile to function, whether it be Night March variants, Plasma Flareon’s Vengeance attack, Vespiquen’s Bee Revenge attack, Marshadow-GX’s ability to copy attacks from Basic Pokémon in your discard pile, or energy recovery from Eelectrik/Bronzong/Malamar. But because he is banned from all sanctioned tournaments (not sure about Unlimited, I’ve asked a Judge and he said I can use him), you have to look elsewhere. There’s Karen that can put all Pokemon from the discard pile into their decks, which will catch some decks off guard. I have yet to see a card that makes both players shuffle all energy cards from the discard pile into their decks. Wishful thinking, I suppose. One last thing to add though: he should not have attached his gadgets causing trouble. So two of the villains are banned (Lysandre and Ghetsis); what’s next? Archie/Maxie or even Guzma? Lysandre’s Trump Card – the stuff of legends! The first card ever banned by the designers. I remember when I first heard about this card – it wasn’t banned long before I started playing in 2016 – and I’ve gotta tell you, I was absolutely shocked that this card ever saw print. Seriously, put all of the cards in your discard pile back in your deck? Did they not realize that games might never end? It really surprised me that this card was made, considering the tendency to under power cards they create. For those of you who don’t know, LTC was legal for six months! It came to the US in November of 2014 but wasn’t banned until June of 2015. After seeing players completely burn through the majority of their cards, however – using the newly introduced Shaymin EX – and then promptly shuffle all of those cards right back into their deck, Pokemon quickly realized it had created a monstrosity. And to their credit, the did the absolute right thing and admitted they made a mistake. The game was spiraling out of control, and they did what needed to be done to fix it. I watched one video featuring Lysandre’s Trump Card and Shaymin EX on Youtube. Insanity! Roller Skates, Hypnotoxic Laser, AZ to pull Shaymins up and use them again. They were the most one sided games I’ve ever seen. Pokemon definitely did the right thing in banning LTC, and in time we’ll probably see that they’re doing the right thing again in their choices last week. which is quite the list. To begin with, it is hard to tell how none of these occurred to the powers-that-be when they went to release this card. Yes, most of this stems from the combos available to the Lysandre’s Trump Card, but the cards that made those combos were either already available and seeing at least some successful competitive play OR released alongside it and soon saw successful play. Perhaps the most obvious example is VS Seeker, a card that would have taken first place in our XY – Phantom Forces countdown if we had allowed “significant” reprints at the time (and the reason we made an exception to the “No Reprints” rule in the first place). Lysandre’s Trump Card being unable to recycle itself is clearly a means of keeping it in check… except it released alongside an Item that allows a player to add a Supporter from the discard pile to the hand. An Item that Lysandre’s Trump Card can then recycle. Yes, Lysandre’s Trump Card costs you your Supporter for the turn; this is not insignificant, but as we discovered (or confirmed), when you can recycle everything you can run a lot of Items in heavy quantities you might not normally be able to risk, like Acro Bike, Bicycle, and Roller Skates. Slurpuff (XY – Phantom Forces 69/119) and later Shaymin-EX (XY – Roaring Skies 77/108, 106/108) also provided another means of drawing without relying on your Supporter, and it isn’t like a deck needed to use Lysandre’s Trump Card every turn. Items like Crushing Hammer, Hypnotoxic Laser, and Super Scoop Up – already popular and potent at various times – were easy to spam, so if you got “tails”, you just played as many as you had handy then recycled them and tried again on another turn. Battle Compressor could toss Lysandre’s Trump Card and up to two other cards into your discard pile, and with VS Seeker this provided a “Supporter searching” combo for many decks. Seistmitoad-EX became the most infamous abuser of Lysandre’s Trump Card; sure, your opponent got back everything when you hit the reset switch, but it was okay because you used disruption and its “Quaking Punch” attack to make it almost impossible for your opponent to take Prizes, while you slowly chipped away at HP and kept discarding Energy faster than your opponent could attach it. Lysandre’s Trump Card may have been released because several potent cards like Bronzong (XY – Black Star Promos XY21; XY – Phantom Forces 61/119) and the Night March trio were so potent but also heavily reliant on maintaining their discard piles. Night March went from a “fun” (maybe a rogue deck) to one of (often the) best deck in the format when Lysandre’s Trump Card was banned… and that was still better than having games that might take hours – yes, as in “plural” – to finish a game, let alone a match. While there are time limits for official tournaments, often the finals are allowed to proceed with a longer time limit or none at all, and that is what finally got the powers-that-be to take notice and ban Lysandre’s Trump Card. As a reminder, just because something is banned does not mean I will automatically give it a perfect score. Not all “broken” cards are equally potent, and some can be quite specialized, so they’ll get whatever score they would have if they were legal. As this card was already banned, the scores below are hypothetical. Except for Limited, where it is just a wild guess as it has been so long since I could attend a Pre-Release and this set is now a few years old.